From left to right: Jesse Painter, Noramco Operations Superintendent, VP of United Way Resource Development, Gerry Taylor, Karen James, Noramco Director, Regulatory Affairs, Gnel Mkrtchyan, Noramco Director, Upstream Research and Development, United Way Chair, Rhodes McLenahan. Last fall the Athens site participated in the 2018 United Way Campaign with a goal to pledge $10,000.00 to support 18 agencies in Northeast Georgia. Our team exceeded that goal, raising $12,131.08! Thank you to everyone who participated in the campaign. The donations help some of the most vulnerable citizens in our area. Our valiant efforts have been recognized by the United Way Campaign Chair, Rhodes McLenahan and VP of Resource Development, Gerry Taylor. 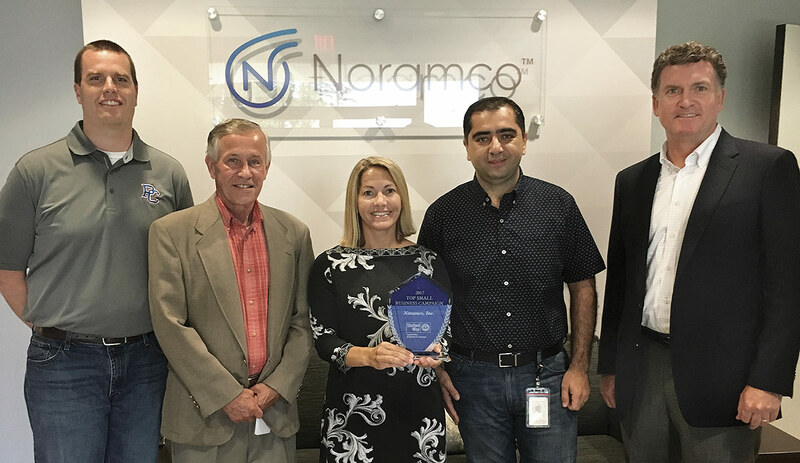 On June 5th, the Noramco Athens site was awarded the 2018 Business of the Year trophy.